MMPR FOCUS: WHAT MAKES BRAND LOYALTY? What really makes customers/clients/the public to be loyal to a brand or business? Brand loyalty, in marketing, consists of a consumer’s commitment to repurchase or otherwise continue using the brand and can be demonstrated by repeated buying of a product or service, or other positive behaviours such as word of mouth advocacy. It is determined by several distinct psychological processes and it entails multivariate measurements. 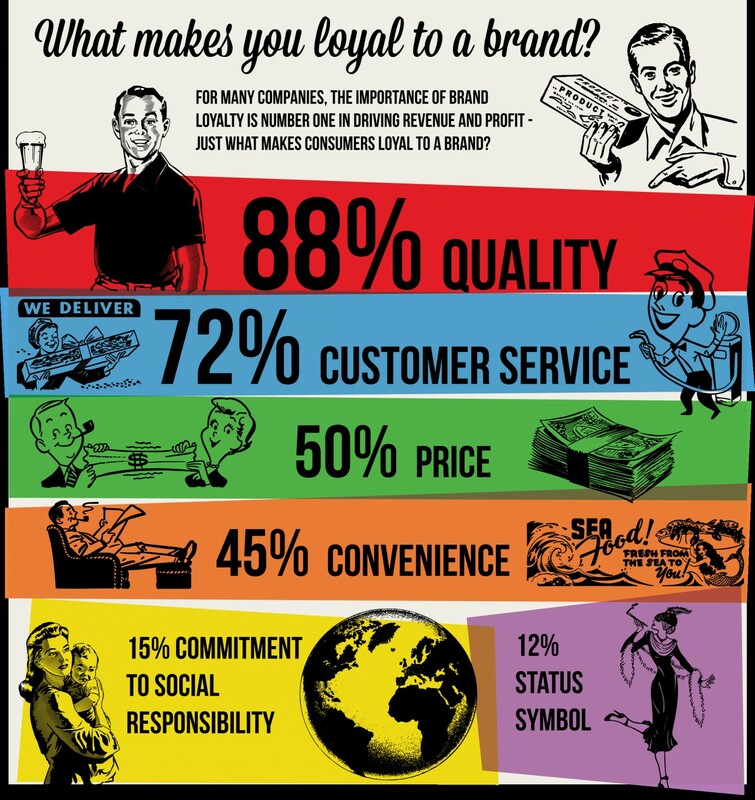 This infographic below shows simply factors that can drive brand loyalty. A retro theme with some bright colours. Check on it! Do you agree? Drop your comments below. Previous PostPrevious MMPR FOCUS: « MON PERE M’A TOUJOURS DIT NE LAISSE JAMAIS UN HOMME PAYER QUELQUE CHOSE POUR TOI » DECLARE OLIVIA SONG LA FEMME DU FOOTBALLEUR ALEX SONG DANS LE DEUXIEME NUMERO DE VAULT MAGAZINE! AT-IL RAISON?